A Seton education is designed to provide students with a totally solid knowledge foundation, not only to be able to function well in the world, but also (and more importantly) to live a good life and become a saint. In the words of Dr. Mary Kay Clark, Seton’s founder, “The purpose of a Seton education is for students to keep their Catholic Faith!” As you may know, this focus permeates all of Seton’s courses and materials. It is our point of departure and our intended destination. It is what sets Seton apart from all other schools or curriculums. Because of this, one of the most exciting aspects of being a guidance counselor is speaking with students about their hopes and potential career paths. These are typically students who are already well-formed and ready to live for Christ. While some people seem to have it all figured out, others still need time and life experience to make wise decisions regarding their vocational future. Put another way, it is not always clear to them what will be a good fit and make them happy. Sometimes multiple occupations are appealing and no clear path is apparent. 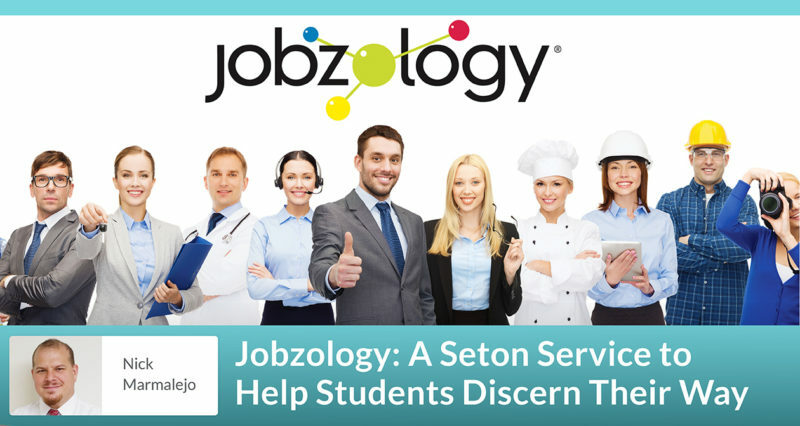 To aid in this process, Seton has contracted with Jobzology. The company and its software use the sciences of psychology and analytics to provide students, after they have answered an easy personality questionnaire, with career choices that are likely to suit them. I took the test and was impressed—it nailed me pretty well, with guidance counselor and teacher being among several top career choices. It also noted several of my previous occupations, such as Facilities Director and Furniture Maker, and others that I have at one time considered, like EMT or Police Officer. However, as with any personality assessment of this sort, your mileage may vary. This tool is not an oracle. It is only a tool—we think a very helpful one—but it does not necessarily tell you what the perfect path in life for you will be. (It would be great if it did, though!) Outcomes from the test largely depend on the quality of the input of the student’s answers. For example, if a student does not yet know whether he or she prefers working alone or in groups, there could be discrepancies in the feedback in the analytics and in consequent job suggestions. The software is appealing for several reasons. First, it is easy to use. Second, the questionnaires are fun. Third, when it gives you your personal career results, the job descriptions are linked and aligned with the information found on the federal government’s Bureau of Labor and Statistics website. This instantaneously provides the test-taker with extremely valuable data about the working conditions and job prospects, now and in the years ahead. Finally, Jobzology also links to current classified ads for the positions in your results. If you want to know how to qualify for being a project manager for a specific company, see the wanted ads and find out! In sum, the software from Jobzology is a self-assessment tool to help you sort out your vocation as you decide on a college, trade program, or other life path. We believe that it will provide you with valuable information regarding how your personality may be suited to differing career choices. The Jobzology questionnaire is currently available to all enrolled students in grade 8 or above. Simply log in to your MySeton page and click the icon on your homepage. This will take you to the test questionnaire. The test can be taken multiple times and at your convenience. Even if you think you have your future in the bag and all figured out, I encourage you to take the test anyway. It may provide you with some job ideas or aspects of jobs that you never considered, or it may give you further information on the career path you have already chosen. Please let us know if you have found this tool helpful, so we can continue to provide this service to you and your family.